Find the healthy, nutritious natural and organic food you want at restaurants, stores, farms, markets and co-ops in and around Ottawa and Eastern Ontario. New Terra Natural Food makes it easy! New! 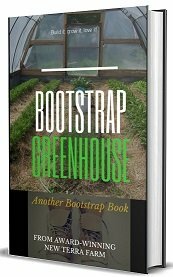 Get the latest Bootstrap Book from New Terra Farm . . . So, who are we (and why are we perpetrating bad poetry)? New Terra Farm is a small family-owned business located near Merrickville, Ontario. We grow a lot of our own veggies and meats, with limited quantities for sale. Trust us, we grow-it better than we po-et! Natural is better! Foods grown organically have more of the good stuff (vitamins, minerals and other factors that promote good health) and less of the bad stuff (i.e. herbicides and pesticides) in them. If you are as concerned as we are about what's in the food you eat, then go natural! Get more information about this topic (some very scary!) via the links and reports on our Organic Advantage page. Farm grown is better! Purchasing directly from organic farms and farmers' markets helps guarantee fresh produce. Farmers' markets and home delivery food basket programs (also known as Community Supported Agriculture or CSA) are a great source of natural and organic food for your family. Pasture-raised is better! There is growing evidence to show that raising animals on pasture is better for the animal, better for the farmer, better for the environment and produces food that is better for the consumer. Find out more on our Organic Farming and Animals Welfare page. Local is better! Current statistics show that over 85% of natural and organic food eaten by Canadians comes from outside the country. It takes 1500 calories of petrochemical energy to get 1 calorie of food energy to Canada from California. That is the definition of 'not sustainable'! Buy local, get great food, support your local grower and save the environment, all at the same time! Look for local, Ontario, or Canadian sources (preferably in that order) for natural foods and organic packaged and prepared foods as well. Now what, oh wise yet humble farmer/poet? You can follow the links or the navigation bar at left to find sources and resources for natural and organic food in Ottawa and Eastern Ontario. For the rest of the world, we have information about growing, cooking, preserving and enjoying good natural and organic food that's also good for you. We're planning a whole new gig for 2017, working with the Two Rivers Food Hub to bring you the best of our all-natural farm goodies. Stay tuned for more info! New Terra Farm received the Premier's Award for Agri-food Innovation Excellence for our innovative small farm marketing and management model. 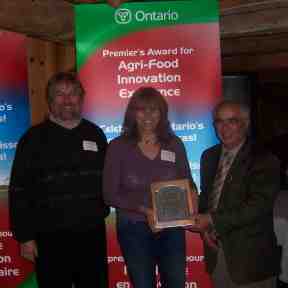 Find out more about the award on our New Terra Farm page, or Contact da Farm for details. The award is just one reason we believe that there's never been a better time to be a market gardener! Demand for fresh, natural and organic food is soaring: the market in North America is growing by at least 20% annually. If you are a small farmer (or are thinking about starting a market garden), don't miss finding out more about about our prize-winning market gardening model and take home some lessons from our efforts to launch a successful small farm (without having to spend a fortune.) Hey, they gave us the award, we must have done something right! We didn't have a lot of money, or equipment, or a huge farm, but we found a way to make our farm work anyway. If that describes your situation, you might want to check out the Bootstrap Market Gardening book, to find out how we did it! Farmers (and all you others!) Want a website that works, guaranteed? How did two simple farmer/poets grow a cool web site? Find out here! Reach out and touch da farm! A review Ken Evoy's SiteBuildIt! Raising chickens for meat and money. How to raise chickens organically. Raising chickens is a great business for small land owners. Learn how to raise chickens organically for your freezer and your customers. Our free market gardening guide could have helped this beginning market gardener avoid a costly mistake. How to build your bootstrap market garden plan to feed your hungry customers! What do you need to know about chicken coop construction to successfully build your own chciken coop? Raising pigs on pasture is a great way to put meat in your freezer and money in your wallet. Learn how to farm from award-winning New Terra Farm. If you seriously want to make money on your small farm, start here! The advantages of organic food - are they real or just hype? What are the advantages of organic food? Get the factoids about organic food benefits and organic food trends from New Terra Farm! Dining out in Eastern Ontario and looking for some great organic food restaurants? Check out our sources for whole natural eats! If you have 25 acres or 5 acres or even less than 1 acre, organic chicken farming can put food in your freezer and money in your wallet. Here's how to create an affiliate business online opportunity to launch a business without any products of your own. An infopreneur makes money by gathering and selling electronic information. My favorite online business idea is that of infopreneur. The web makes selling information products easy. Growing for market is one of the best jobs there is, and Community Supported Agriculture is the best model for new farmers to follow. If you are thinking about market farming as a career, here's a few points to consider before you take the leap. What dos it take to achieve CSA success? Check out these 7 success secrets. If you have access to a small piece of land, you can learn how to live cheap by providing much of your own food. 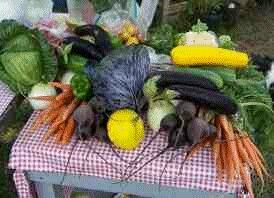 Vegetable farming for profit is different from growing your home garden. Here's some things you need to know. Community Supported Agriculture is a powerful model with benefits for market gardeners and customers. Exactly how mucj meat can you expect if you are raising pigs for meat? Growing a high income market garden requires careful crop selection. Here's how! How much money can you reasonably expect to make when small farming for profit? Small greenhouses are a great investment for small farms. Find out why here . . .
Is a multi-farm CSA the way for small farms to feed communities? What can you grow on a quarter acre farm to make some income? Great specials and sales from New Terra Farm. Get 'em while they're hot! Are mini farms the way to secure our food supply? Being a part time farmer is a great gig. Here's how to get started. What does the future of farming look like? Big agri-business or family farms? Can't find a summer job? Start a student CSA instead!